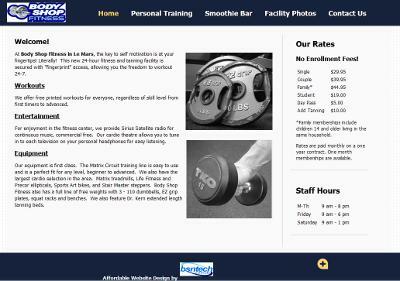 BsnTech Networks has completed another affordable website design for Body Shop Fitness based in Le Mars, IA. The owner, John, contacted us a few weeks back to create a website for his business. He provided a logo that was already made along with several pictures and a brochure. We took the information and brochure and setup a low-cost website design for him. After changing around a few pictures today, we’ve now completed the site and he is happy with the results. At BsnTech, we understand that the economy is tough and especially when you are a small business owner, it is hard to compete with other large corporations to stay afloat. Almost all of our customers are just starting out and need to have a website designed. Others already have a website and are looking to just have a few changes done – or to have a completely new website designed. Our rates are still very low and we’ve not raised our prices for website design since we started 13 years ago. That is how to beat inflation!